A few years ago my school district adopted Pearson’s Reading Street program. I was excited that all kindergarten – fifth grade classes in our district would be using the same program, but I was also overwhelmed at the amount of content provided. The Reading Street program is set up with a lot of teacher instruction. I really like the small group activities they provide, but I’ve always lacked the time to get to them. I feel like for past two years, I’ve spent the the majority of my reading block instructing my students. Then I would have just a small portion of time left to let the students actually practice their reading skills; releasing them to worksheets or, if they were lucky, to hands-on activities that I created. As I prepare for my third year teaching the program, I’m searching for ways to become the “guide on the side” instead of the “sage on the stage” that I feel I’ve been the past two years. I’m turning to Gynzy once again for help. One major benefit of using Gynzy is the organization. I’m sure some of you are like me and have limited wall space. I would love to keep anchor charts visible throughout the day but it is not an option. With Gynzy I can create a new page for each component and save it all as one lesson. These lessons will be saved in my “Reading Street” folder to reference concepts throughout the story and the rest of the year. If I am ever out, the substitute can open one folder and have access to everything needed to teach reading. Our reading program has set components that we must cover over the course of each story, including a concept map, text-based comprehension, vocabulary, word analysis, and spelling. We try to, but don’t always get to conventions and handwriting. There is also a writing component which I use Gynzy with and I will cover in a future blog. I’m imagining that with use of Gynzy, these activities will be presented both as whole class activities and small group activities, depending on the story. In the upcoming paragraphs I will explain which Gynzy tools I am going to use next school year in order to make the reading lessons effective, interactive and fun. 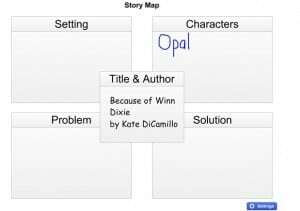 In the examples, I will use the first story that will come up next school year; ‘Because of Winn Dixie’ by Kate DiCamillo to explain which Gynzy activities I might use to make my reading lesson interactive. The first component provided by Reading Street is the concept map. It is introduced on day one of each new story and is updated daily in Pearson’s reading Street program. Gynzy’s Tree Map works well for organizing the concept map and visualizing it in front of class. 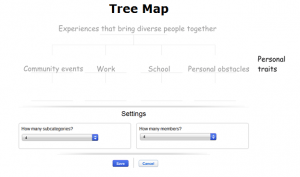 The Tree Map allows for up to four subcategories and four members in each subcategory. You can type on and/or write on the Tree Map. Because of my not so neat handwriting, I prefer to type whenever possible but I give students the option of typing (using my wireless keyboard) or writing it out. Also, some Reading Street concept maps have five subcategories so the fifth one would have to be added off to the side like I did with “personal traits”. Making our concept map interactive on the whiteboard gives me some huge benefits. The interactive whiteboard allows students to be involved in the creation of the map and have more ownership and engagement. I can also take a screenshot of the completed map, or any of the other activities, and share them electronically with the students for future use. This saves me a lot of time. Throughout each story, different text based comprehension skills are practiced. In Because of Winn Dixie, we work on summarizing and sequencing. Summarizing and sequencing are taught as two different strategies but I tie them together when reviewing stories. For summarizing, I start out with Gynzy’s Story Map. 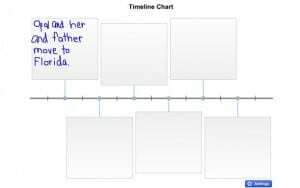 I used the Story Map with most Reading Street stories last year, as it is a straightforward way of presenting an overview of the text, even if we weren’t working on summarizing. For sequencing I will add Gynzy’s Timeline Chart as my next slide. In the Timeline Chart settings, you can select 2 – 20 events to be shown. This range makes this tool useful for a variety of activities. You could differentiate between retelling (using fewer events) and summarizing (using more events). Each Reading Street story also has selected vocabulary and ‘amazing’ words. 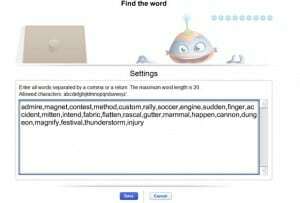 While we cover both equally, only the selected vocabulary words are tested. 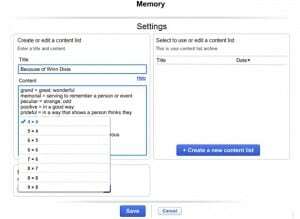 Using Gynzy’s tool ‘Create your own Memory Game’, you can choose which words you want included by simply entering in the words and definitions. This memory game gives students the possibility to learn and repeat those words. The size of board you select (see below) determines the number of words and definitions you enter. Because of Winn Dixie has seven selection vocabulary words so I added one amazing word to be able to use the 4X4 board. ‘Create your own Memory Game’ is presented as a two person or two team activity. During guided reading this could be the vocabulary activity for a small group of students. This would also be an activity to use in the spare minutes before lunch or specials. The word analysis component of Reading Street’s varies from week to week. For the first week, we cover word-endings – ed. 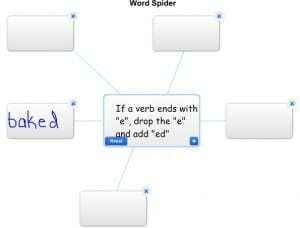 In the past we brainstormed and analyzed words on a blank Gynzy screen but since Word Spider is one of my favorite tools, I’ll share how I could use it with word analysis. After writing the topic in the center box you click on the + to add up to 14 additional boxes. I would add a page for each different word-ending rule. Once this is saved, it can be opened daily to add -ed words found in the story. This makes word analysis a fun and continuous process. Each Reading Street story gives 25 or 26 spelling words. I love to use Hangman to teach spelling since Hangman is a fun way to practice. We use it after I’ve introduced the list of words and my students know the spelling rule. For example, in Because of Winn Dixie, my students know to look for the VCCV pattern. Gynzy has two Hangman games. One option, Hangman, has a preset word bank and allows you to select if you want words with a maximum of 5, 10, or 20 letters. In Hangman with your own Words, you can enter a list of words. It took me just a few minutes to type in the 25 words for our first story. Hangman is a great activity to pull up when you have a few minutes between subjects or at the end of the day. My fourth graders really got a kick out of the robot and the sound effects. Every story introduces or reviews a different convention. In Because of Winn Dixie, we only need to cover declarative and interrogative sentences. I will give a general overview of all sentences types available; and then lead into Gynzy’s ‘4 Sentence Types’ in order to practice sentence types. This gives students a feeling of how this concept works and gives me a feeling of how students are understanding of the concept. Afterwards I will discuss the sentences in the story. Notice this example is showing slide 12 of 40. Most of Gynzy’s activities give at least 40 practice problems. This not only allows for all of my students to have a turn but provides enough examples that I have a good idea of each students’ understanding of the concept. I think this handwriting tool is pretty self explanatory. Notice that you can select Zaner Bloser or D’Nealian. I don’t think that I would use this tool with my entire class. 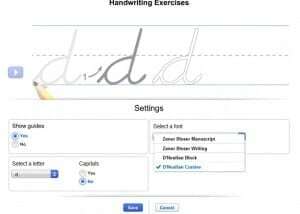 But, when introducing cursive handwriting, having the lines and large screen will ensure that all students can see me modeling how to form the letters. Another benefit of this whiteboard activity, is that students that struggle with fine motor skills can practice letter formation on the whiteboard and get feedback from the teacher before practicing independently. I’m looking forward to incorporating Gynzy with our Reading Street program on a daily basis. How do you see yourself using Gynzy with reading?